Akarna Dhanurasana literally means ear bow pose, since Karna means ear in Sanskrit, while the prefix ‘A’ means near and Dhanur means bow. However, since the body of the practitioner resembles a bow and arrow or an archer aims to release an arrow from a bow, this asana is usually known shooting bow posture. 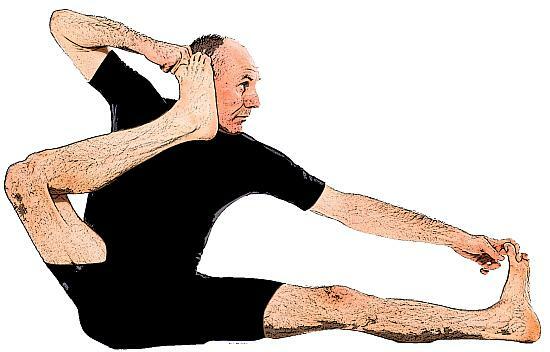 The main purpose of the asana is to pull the foot near the ear to resemble an archer. You should firmly in Dandasana on the ground and keep your legs straight out together in front of your body. The head, shoulders and back should remain straight while you are doing this. When you are fully comfortable in this position, you should keep your palms on the thighs, while inhaling deeply. You should slide down the right hand towards the big toe of the right foot. When you have caught hold of the toe, you should pull your right foot towards the face. At the same time, you should slide down the left hand to reach and catch the big toe of your left foot. They should remain firm on the ground. Now you should move your right foot along with your right hand from the front of your face towards your right ear. You can stay in this position for 15 seconds to one minute. You should return to your original position, while exhaling. You should repeat steps 3 to 7 with the left leg. You should repeat this posture at least twice for each leg for maximum effect. Beginners should not try this asana without the guidance and assistance of an expert yoga master. Since this asana belongs to the intermediate level category, the practitioner should do this asana only after mastering all the basic asanas and a few intermediate asanas. Pregnant women and persons suffering from spinal injuries should not perform this asana. The anatomical focus in Akarna Dhanurasana is on the thighs, groins, belly, chest, shoulders, neck, and spine. Hence, this asana strengthens the legs, builds up core muscles and improves concentration and grace. Akarna Dhanurasana improves digestion process, treats indigestion problems and clears constipation. It heals pain in lower abdomen areas and in the large intestines. This asana regularizes the menstrual cycle for the majority of women. Your breathing capacity becomes greatly enhanced when you perform Akarna Dhanurasana, since it expands the lungs and increases their oxygen holding capacity. When you have become an expert in the basic Akarna Dhanurasana, you can use your left hand to pull your right leg to your right ear and the right hand to pull your left leg to your left ear. However, it is quite a complicated manoeuvre and you should perform this only under the supervision of your yoga master until you are able to perform this comfortably. The preparatory asanas for Akarna Dhanurasana are Virasana, Setu Bandha Sarvangasana, Bhujangasana and Urdhva Mukha Svanasana. The follow-up asanas are Supta Padangustasana and Ardha Matsyendrasana.